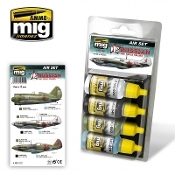 High-quality acrylic paint set includes all 4 colors used to accurately apply the camouflage for aircraft of the Soviet Air Force during the early years of World War II. This set is designed for aircraft such as the famous MiG-3, LaGG-3, Yak-1, and the mythical Polikarpov I-16 and includes color references for the most accurate finish. This set includes 4 colors in 17mL bottles. Each bottle features a steel agitator to facilitate thorough mixing of the paint and must be shaken before each use. Each color is water soluble, odorless, and non-toxic. We recommend A.MIG-2000 Acrylic Thinner for proper dilution. Dries completely in 24 hours.